Cheshire at Denman - Discovering Oxford! From the 23rd to 26th August, three of our members - Pat Symms, Val Wilson and I attended the Cheshire at Denman weekend. Purely by coincidence we had all been allocated to the same course - Discover Oxford with a touch of Abingdon. Denman College was filled with Cheshire ladies, 84 in all. We arrived on the Thursday afternoon in two coaches, full of enthusiasm and anticipation, just in time for afternoon tea! After settling into our rooms we enjoyed a very good dinner and met our course tutors - in our case Chris Lloyd, a well respected Oxford guide and a native of Liverpool. I should mention here that there were only ten of us on Chris's course due to our original choices being over-subscribed. In retrospect we considered ourselves very lucky. Next morning we met up with Chris and set off on the coach to Abingdon where we were shown around St. Helen's Church, St. Nicholas Church and the site of the Benedictine Abbey of St. Mary which had been destroyed by Henry VIII in 1538. We then took the steamer service from Abingdon to Oxford along the River Thames. After a very enjoyable two hour cruise we arrived at our destination. Following a good pub lunch we spent an enjoyable afternoon in Oxford taking in a number of well known landmarks including Christ Church, Balliol and the Martyr's Cross. Chris told us about the foundation of the colleges and college system and how it differs from most other universities. As an Oxford guide he was hugely knowlegeable and gave us a great deal of information in a very interesting and humorous way. After an excellent day (with no rain!!) we returned to Denman just in time for afternoon tea - again. Following dinner later on we joined Chris in our tutor room for a resume of the day and more interesting information. The following day, Saturday we set off - 9.a.m- back into Oxford. This time we visited, amongst other buildings, Jesus College, Hertford College, the Radcliffe Camera, the Bodleian Library and the covered market. We had another thoroughly enjoyable day, taking in more information than I could possibly tell you here. Despite an enormous downpour later in the afternoon we returned to Denman in high spirits. Following dinner that evening all the groups got together for an informal evening of entertainment. This was greatly enjoyed by everybody. I should mention here that we were encouraged to use the bar and all its facilities and encouraged to buy wine by the bottle rather than by the glass! This was because all the profits from the bar go towards maintaining and buying the carpets for the college. The following morning, Sunday, Chris joined us again from his home in Abingdon for a final get together and wrap-up of the course. 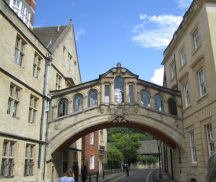 We watched a 45 minute video about the history of Oxford which was extremely enjoyable. We thanked Chris for having given us such a wonderful time. The fact that there were only ten of us on the course had meant that we had been able to get more out of it than had we been in a group of twenty, and made it all the more memorable. Before lunch we had had time to look at the results of the two practical courses that had been running i.e. Triptych of Techniques and Edible Gifts. We had listened to the results of the singing course - Girls in Harmony - the previous day and we had been sharing the coach each time with the final two courses - Gardens of Oxford and Ramble and Cruise the Thames. After lunch we gathered our luggage and boarded the two coaches to set off back home - to the final destinations of Chester and Macclesfield. I should mention here that, very unfortunately, one of the Cheshire ladies had fallen as she embarked on the coach at Macclesfield and had been taken directly to hospital. During the weekend we heard that she had broken her ankle. Pat, Val and I were dropped off at Tarvin Sands lay-by with the other ladies from our locality - and were home very shortly afterwards. We had had a thoroughly enjoyable weekend which I have described, only briefly, above. It will be three years to the next "Cheshire at Denman" and I would recommend it very highly indeed. The Cheshire at Denman weekend had been organised by Kathy Baldwin - a huge task - I am sure she is very glad that the weekend was a great success and she has all our thanks. Photographs and text by Anne Tonge - 2nd September 2012.